City School* is a medium-sized suburban comprehensive for 11-16-year-olds, which usually achieves good academic results despite substantial behaviour problems. The vast majority of its pupils are white and working-class. Pupils are streamed by ability into eight sets from their first day at the school. An acquaintance of mine, SD, taught humanities to the ‘intervention classes’, the small ‘bottom sets’ in Years 7-9 (ages 11-14) which receive extra support for their additional learning and behavioural needs. She had her own small classroom and some degree of freedom from the testing regime operating in the rest of the school. Hearing that I was beginning research into storytelling with adolescents, she invited me to come and tell some stories to each of her three classes – ‘to give them a new experience’. I was keen to include a mainstream school in my research settings, to test the applicability of storytelling in a setting which conditions most adolescents’ lives. I chose some substantial stories (a Maori myth, a Sumerian epic, and a contemporary true story from Malawi) in response to her description of the classes and their interests. I pulled the chairs round into a circle, and SD and the teaching assistants (TAs) sat around it with the pupils. The young people, once they had got over the surprising change from routine and the opportunities it offered for mischief, listened with an intensity that surprised both the teacher and TAs, as did the level of discussion afterwards. 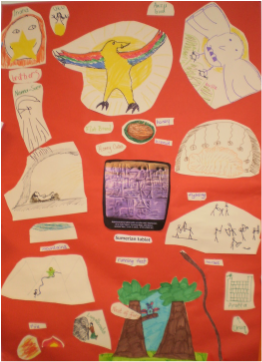 Together we made posters retelling the stories, during which time the headteacher and a colleague paid a rare and fortuitous visit to the classroom, and were regaled by a detailed and vivid account of the story of Hatupatu by two of the pupils. SD felt that, for once, they had been able to show what they were capable of. ﻿SD felt the initial sessions to have been so successful that we decided to repeat them at twice-termly intervals. To allay her concerns as to justifying the time she dedicated to storytelling, I brought stories which linked to the classes’ history or geography topics. We continued this work for two years, usually planning the sessions together. 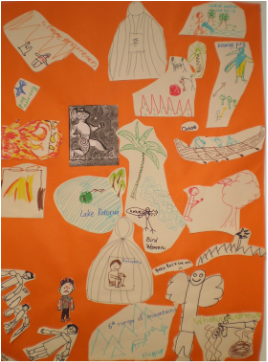 Sessions roughly followed a skeleton structure: warm-up activities, a story from me, then some collective creative response (drama, poster-making, poetry, music, debating, or continuing the story) which made the story the class’ own. Getting to know the pupils, I brought games to develop their storytelling skills and broadened our repertoire of response activities. (See story of practice 'Layering stories at City School' for more detail on a short series of workshops with one of these groups.) Increasingly, we allowed sessions to take their own shape, as individuals would trigger off discussions in response to a story, or be reminded of their own stories. We also pursued the pupils’ ideas from one session to the next: for example, when one young girl expressed curiosity about ‘different kinds of storytelling’, we held a one-off ‘club’ to which we invited Indian dancer and physical storyteller Shrikant Subramaniam, told Indian stories individually prepared by each class, and shared Indian snacks. I was also able to bring one of the classes to the theatre for a day of storytelling and animation in the ICAN centre, and bring other visitors to share stories with them. We also elicited their own views on storytelling in a focus group session. Particular individuals emerged as talented storytellers who took a lead in our storytelling sessions. When an opportunity arose at the theatre for young storytellers to perform, I mentored two of these young boys to develop a duo performance (see ‘Informal Mentoring’). The Inclusion Department within which SD was located had a strongly collegiate atmosphere, and joining the teachers and teaching assistants in their staffroom became an important part of my days with the intervention classes. TAs, who circulated between this department and the mainstream of the school, passed on their observations of the pupils’ responses to storytelling in comparison to other lessons; teachers and TAs shared their ideas for stories that could be of use in giving pupils a contextual understanding of different topics; we discussed both the restrictions and opportunities of the curriculum as to including storytelling in learning, particularly with these ‘intervention sets’. At the request of the head of department, I led a training session for TAs on storytelling in the curriculum. 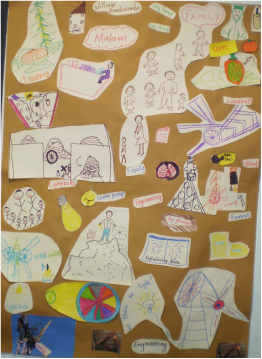 It was during such interactions, and during planning and evaluation discussions with SD, that I started to identify the strengths of a pedagogy based around storytelling for the young people of the ‘intervention sets’, and the ways in which such a narrative approach ran counter to dominant trends within the school’s teaching. SD and I drafted an academic paper together, incorporating her teacher’s voice and my storyteller’s voice in dialogue, which is yet to find a publisher. Curious to gain a broader picture of how storytelling sessions would play out in the mainstream of the school, at the invitation of the head of the Communications Department, I ran three-week storytelling projects in the English classes of all eight streams of Year 8 (12-13-year-olds). To each class I brought a different story and, depending on their initial responses, different ways of working on the themes it generated: starting with pupils’ own repertoires of stories, using storytelling games to generate collective retellings, creative writing and performances. Wishing to contrast my ‘lessons’ with those the pupils usually experienced, I spent a day observing normal English lessons of a variety of year groups and sets. Expecting a more skills-based, fast-paced and target-driven style of teaching, I was nonetheless surprised at the starkness of the contrast: all teachers repeatedly reminded pupils of the need to meet specific assessment criteria, and poems were interrupted almost on a line-by-line basis for analysis of stylistic devices. I wished to carve out an inclusive space for creative storytelling in the school. The Communications Department was eager to continue the momentum of the storytelling sessions and helped me to start a weekly lunchtime storytelling club for interested pupils. After promoting the club by running assemblies, and writing articles in the school newsletter, I soon had large numbers of pupils, mostly girls aged 12-14, attending haphazardly. The group consisted broadly of two factions: keen and sensitive storytelling aficionados, and unpredictable and restless young girls looking for something interesting to do. The two groups antagonised each other, the latter undermining the atmosphere the former wished to create. By the end of the first term, we had reached a fragile balance of hilarity, games, and projects, which was starting to merge their interests and generate interesting ambitions, and given time I think a confident and mutually respectful group would have formed. However, time was precisely what we did not have. So as to limit behaviour problems at lunchtime, the pupils’ lunchbreak was extremely short, with lunch queues meaning that it was impossible to have everyone present simultaneously at Liars’ Lunch for even 20 minutes, giving us no time for warm-ups or to work through difficulties. The young people were not interested in an after-school club as they had other obligations at that time of day. Under these circumstances the challenge of establishing a supportive and friendly group was too great, and I discontinued the group midway through its second term. See story of practice, 'No Space for Stories at City School'. I thought of my work in City School, which in total comprised over 75 sessions with over 200 pupils, as a residency, although it was never named as such by the school. Within the Inclusion Department, and to some extent within the Communications Department, I felt the possibility of an ‘osmotic’ mutual relationship between myself as storyteller and the school as an institution – opening up interstices within which their educational practice could be challenged and extended, and learning in turn from their knowledge of the young people and their needs. However, the ‘interstice’ of the intervention sets was closing, as these small classes were merged with larger classes to save costs. Changes in education policy meant these young people had to take the same assessments as other pupils, thus lesson time could not be spared for my sessions any longer, no matter how closely related to the curriculum. Together with my failure to carve out an informal storytelling space in the Lunch Club, I felt I had exhausted the options for a meaningful ongoing presence in the school. 'Layering stories at City School' - an episode which brought insight into how young people use the 'gaps' in epic stories to convey their own perspectives. 'No space for stories at City School' - recounting the challenges of establishing an informal storytelling space for pupils at lunchtime, despite their clear desire for one.